Screaming, I really don’t much like screaming—especially if I’m the one doing it. I hear screaming and whatever is doing it just—ain’t—right. My heart is pounding all a sudden. I know Felix is up around the turn in the corridor. I don’t know if he’s killed something and it’s making that noise. He can’t be making that noise… I sure hope not… damn robot gives me the willies enough already. Damn, I knew he would say that. I don’t want to find out, but know I need to. There’s another scream. This time it’s human. Then blaster fire. Then a crack—an all-too-familiar crack—the sound of a bone breaking. That’s followed by a bellow of pain. Felix was definitely in the mix. His hello-how-are-yas for strangers often involved disquieting sounds like bones snapping and grown men whimpering. I push forward and turn the corner. There’s nothing in the immediate hall. The starboard armory hatch is still a little ways further. I turn the next zig and skid to a stop. Terry and Bengal thumping to a halt behind me. A barrel of deck cleaner is overturned in the passageway, and two more have been rolled out of the stowage locker. 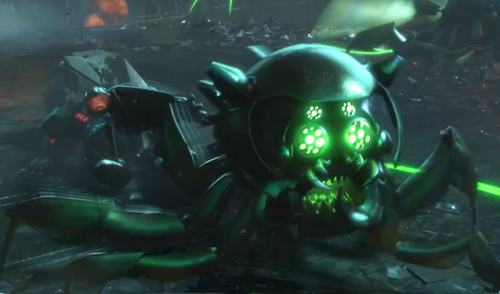 Some kind of silver critter, vaguely like an oversized crab is on its back spinning circles in the green goo. There’s two more on the floor twitching near the wall. A man, not one of our crew, but dressed in Sanchez’s crew pull-ups is huddled in the back of the access clutching an obviously broken arm. I can see bone protruding through the skin, blood is pooling on the floor. He’s got burn spots on his smock and what looks like a stab wound in his shoulder. He’s not going to bother anyone immediately. I look back toward the armory door—it’s part way open—enough for a man to slip through. The heavy metal has been obviously beat on and hit with blasters. The access pad has been torn apart and wires hang out. Felix is no-where in sight. One thing is obvious. The victs managed to get into the armory. Who are these guys? “Spit,” I murmur. I pick my way across the cleaning goo, trying not to get too much of it on my boots. “What the frick are those things?” Bengal asks, pointing to the bugs. “Don’t know no frellin doctor, argh,” he clutches his arm. “The babe with the nice cha-chas,” Bengal adds for emphasis, holding his hands out in front and grasping something invisible. Terry glares at him, then back to the vict. “Is that what hatched out of your space egg?” I ask Terry. “No, I am not,” I hear a cold voice say from down the corridor. Felix comes around the corner. He’s been cut and hit by something. A few scratches on his face bleed red. He doesn’t look happy. Of course, he always looks that way. “What about these things?” Terry asks, throwing the bug to Felix. Felix nods and jogs off down the hall. “I’m sure I don’t want this little parasite wandering around,” Terry says cuffing the vict in the back of the head. “You catch those others, then we can find out about these ‘bug’ things.” He nudges the other dead critter with his foot. This entry was tagged Fiction, Gaming, Ring Realms, Science Fiction, Voyages of the Solomon Grundy, Will Greenway. Bookmark the permalink.